Breakout starlet Heather Anderson is one of the beautiful people, whereas her assistant Jill LeBeau is one of the little people. However, LeBeau really believed her boss when she called her a friend and made vague promises to start developing projects with her. That is why LeBeau is so disappointed to find she is suspected of murdering Anderson in Aaron Katz’s Gemini (trailer here), which opens this Friday in New York. Instead of telling the director face-to-face she will not do re-shoots for his troubled film, thereby likely dooming the project, Anderson sends LeBeau in to do her dirty work for her. She is accustomed to such duties. She also tries to run interference with the stalkerish fan who crashes their table when the furious director storms off and her boss slinks in. Clearly, Anderson depends on LeBeau for both emotional and organizational support. Their relationship is highly ambiguous and fraught with sexual overtones. Nevertheless, LeBeau must not show any signs of jealousy or possessiveness when partying with her boss and Tracy, Anderson’s secret model lover. Technically, they are still employer and employee, whereas jealousy and possessiveness are the specialty of Anderson’s very-ex boyfriend, Devin, whose house she still lives in. You would think there would be plenty of suspects for Columbo-like Det. Edward Ahn to pester, but the murder weapon happens to be LeBeau’s off-the-books handgun, which has her prints all over it. Quite inconveniently, she even accidentally discharged it on the morning in question. You have to give Katz credit, because Gemini just oozes noir style. Cinematographer Andrew Reed dazzles us with nocturnal neon and the glossy, glassy reflective surfaces of the characters’ sunny daylight hours. This is a vision of LA that Curtis Hanson and Roman Polanski would appreciate. Plus, Keegan DeWitt’s jazzy synth score gives it an appropriately freshened-up, ultra-now “crime jazz” vibe. 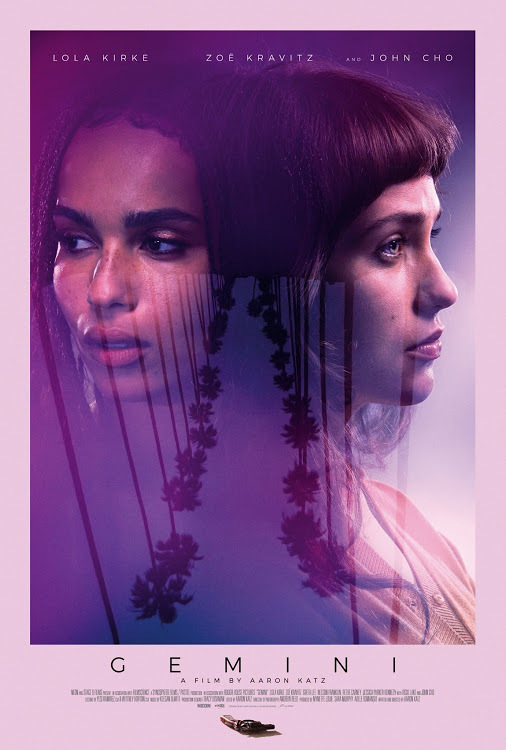 Lola Kirke is quite compelling as LeBeau, who suddenly must confront most of the assumptions that gave her life comfort and structure. She also forges some hard to define, yet undeniably potent chemistry with Zoë Kravitz’s Anderson. Kravitz’s performance is admittedly quite aloof and guarded, but such are the character’s requirements. John Cho adds some energy as the deceptively shrewd Det. Ahn, while Nelson Franklin and Michelle Forbes conspicuously steal their scenes as the director and agent who would not be out of place in Altman’s The Player. For the most part, Gemini is an appealingly evocative Tinsel Town noir, but as in his Portland mumblecore noir, Cold Weather, Katz still has trouble wrapping things up in a convincing manner. Of course, it is the journey into the dark heart of La La Land that matters to genre fans, not the ultimate destination. Basically, it is Chet Baker cool, which is high praise, but not Miles Davis cool. Recommended for fans of LA noir, Gemini opens this Friday (3/30) in New York, at the Angelika Film Center.